Come along and experience the exciting and challenging sport of Curling. This is an activity that should not be missed, with plenty of laughter & shouting. The aim is to finish the game with your stones closest to the centre of the circular target zone, known as the house. 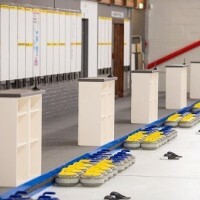 One of the game's most recognisable features is the sweeper - you will see two sweepers, with brushes, skating ahead of each stone and sometimes frantically brushing the ice in front. This keeps the ice slick and keeps the stone moving - stop sweeping at the right time, and the stone will come to rest in exactly the right place. Although this sport may not be as adrenaline pumping or as adventurous as some other sports, the game mood differs a lot when you play it with friends. Aside from basic curling skills, this sport also requires team work.